Festival celebrations serve as such a break from hustle and bustle of daily lives. India rightly called the land of fairs and festivals, provides with an opportunity to forget all about worries and join in celebrations. One of the year's early festivals is Makar Sankranti, Lohri and Pongal, taking place in the second week of January 2018. Closely related to agriculture, one announces the harvest season with great pomp and fervour. One of the beautiful traditions followed during these festivals are making colourful Rangoli designs. Many states in India celebrate Makar Sankranti and Pongal by preparing delicious food and making beautiful rangoli designs at their houses. Makar Sankranti will be celebrated on January 14, 2018, across India. The people of all the communities are excited to design and decorate their home with attractive flowers and Rangoli patterns. Being an auspicious event according to the Hindu calendar, individuals leave no stones unturned in having a lavish celebration. Makar Sankranti Rangoli is a floor art design made with colourful powdered dry colours. 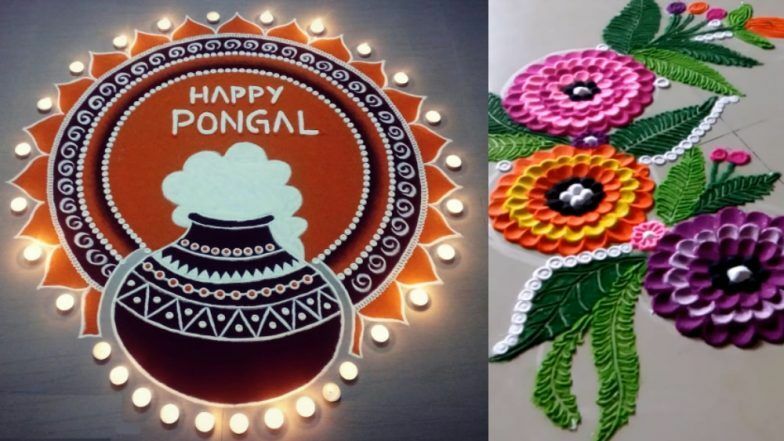 Meanwhile, people of Tamil Nadu celebrate the festival of Pongal over a period of four days, beginning on January 14 and last until January 17. They worship the Sun god and convey their regards to the deity for a successful harvest. On the second day, each house prepares a rangoli or muggulu (in Telegu). The rangoli designs depict celebration and they look amazing with bright colours, flowers, different props such as sugarcane’s, bowl of pulses, rice and so on that are harvested. Here we are presenting a list of simple and beautiful Rangoli patterns that can be made easily during Makar Sankranti and Pongal celebrations. These free-hand designs will add vibrancy and happiness to your celebrations. The below Rangoli-making videos are easy to follow, and you can add your own twist with slight fresh designs around the corner. There is a lot about this one! The Muggulu dot rangoli designs seem tricky of course as one might get muddled from where to start, but once you know the tactics, it is very easy. Sugarcanes are harvested at this time of the year. And to mark the season, the designs unquestionably has sugarcane patterns on them and are also quite pleasing to the eye. Rangolis are usually colourful and to enhance its beauty, they are made with different flower petals. The most common flowers used in designing these rangolis are daisies, roses and marigold. Well, the designs with bright colours and flowers are pretty to look at as they adorn our houses. They are aligned and come out nicely. Get inspired this year, with sweets and rangoli designs for Sankranti. Enjoy the colours, kites, flowers, songs, sweets, bonfire and welcome the first festivals of 2018.